Losing teeth can create an unattractive gap, especially it is apparent when a person smiles. And while losing a molar or two may not be a noticeable, it can affect chewing and may even hamper speech. Fortunately, missing teeth can and should be replaced. Missing teeth can cause the mouth to sag and the face to look older. A bridge helps maintain the natural shape of your face and provides support for your lips and cheeks. A traditional fixed bridge replaces any missing teeth and the teeth adjacent to the missing teeth are prepared as well. 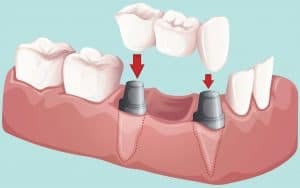 The replacement tooth (pontic) is attached to crowns that cover or cap the natural teeth adjacent to the missing teeth to provide support for the bridge. Different materials can be used to make a bridge. Gold alloys, non-precious alloys, acrylic, porcelain or a combination of these materials may be used. At least 2 visits will be needed to prepare the teeth for the bridge and place the fixed bridge. A crown is a special dental restoration that entirely covers a tooth. Besides strengthening a damaged tooth, a crown can be used to improve its appearance. Crowns can be made from different types of materials such as all poreclain, gold or non precious alloy crowns or porcelain to metal crowns. 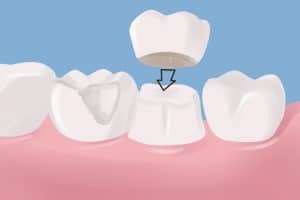 Preparing a tooth for a crown usually takes 2 visits. During the first visit, the tooth is shaped or prepared for the new crown. Impressions are taken and sent to the laboratory, where the new crown is made. A temporary crown, often made of acrylic resin, covers the prepared tooth while the permanent crown is made. When the permanent crown is ready, the temporary crown is removed and the permanent crown is placed.